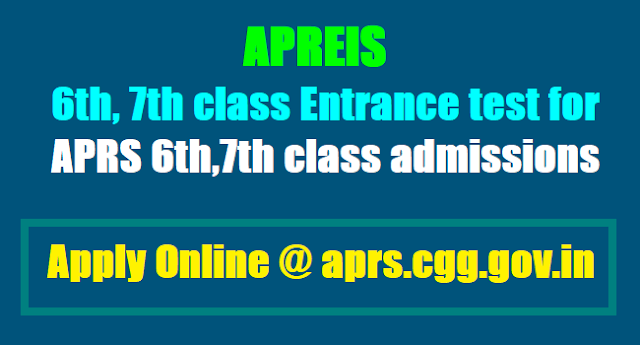 AP Residential Schools Admissions 2018,APREIS/APRS 6th,7th, 8th Classes Admission Test 2018 Notification/ APRIES VI, VII, VIII Classes Admissions 2018 Notification: APREI Society has decided to fill up the backlog vacancies in classes VI to VIII for the academic year 2018-18 in all backlog vacancies in AP Residential Schools including Minority Residential Schools through district level admission test. APREIS has issued the 6th, 7th, 8th Classes Admission Test 2015 notification on 26-06-2015 for admission into above said residential schools and APREI Society invites applications from the eligible students for admission into residential schools. 1) District Convenor should collect all the vacancies from General schools and SC/ST vacancies from Minority Schools of the district and issue frequent news items in local news papers inviting applications duly informing the date and venue of admission test. 2) The applications will be available on http://aprs.cgg.gov.in and www.apresidential.gov.in from 21-07-2018 to 31-07-2018. 3) Admission test will be conducted at District Convenor School on 09-08-2018 under the supervision of the Observer. Question paper for the test will be supplied by the Society. 5) After completion of Admission Test the District Convenors have to send the OMR Answer Sheets to the Society office by the special messenger in sealed packets with the signatures of Chief Superintendent and Observer appointed by the Society. 6) Merit lists and selection lists as per vacancies will be prepared by the Society office. 7) The District Convenor School in the district is Venue for admission test. 8) Date of admission test for VI & VII classes: 09-08-2018. 9) Teaching staff of Convenor School shall be appointed as Invigilators for the Test. If sufficient staff is not available in Convenor School, staff should be drafted from other school of the district. 10) The District Convenor will be the Chief Superintendent for the test. 11) The Officer appointed by the Society i.e. RDS/DS/AGO/PRINCIPAL will act as Observer for the Test. i) Candidate must have studied Class-V for the whole of the academic session 2016-17 in a Government/ Government aided or other recognized schools. ii) Students must have studied continuously for at least TWO years in a Government/Government aided or other recognized schools. i) Candidate must have studied Class-VI for the whole of the academic session 2016-17 in a Government/Government aided or other recognized schools. 3.Study in Rural area: The Student must have studied in Rural area (in case of OC/BC) for the vacancies in General Schools. For SC/ST this is not applicable. In case of vacancies in Minority Schools, Rural Area study shall not apply to all categories. 4. Nativity: Students must have studied in the concerned District during 2016-17. 5. Selection mode: Selection Based on the merit in the Admission test and rule of reservation. 1. If the No. of applications are less than the available vacancies, then all the candidates may be provided admission. 2. If No. of candidates are out numbered the vacancies, then the list is to be sent to the O/o the Secretary, APREI Society, Hyderabad for selection of candidates for admission through a committee. 3. Principals should verify the certificates pertaining to Date of birth, study certificate, community certificate, income certificate of the candidates before giving admission to the candidates in class V/VI/VII and VIII and satisfy themselves that the candidates full fills the required eligibility criteria. a) Admission test would be conducted at Convenor School on the specified date under the supervision of the observer. Question paper for the admission test will be supplied by the Society through the Observer. b) After completion of the test, valuation of scripts will be done on the same day at the Convener School. c) Merit list should be prepared under the supervision of the Observer on the same day. District Convener should operate the merit list till the vacancies are filled. d) Venue of Admission test: District Convener School in each District. 1. Submission of Online application forms from 21-07-2018 to 31-07-2018.